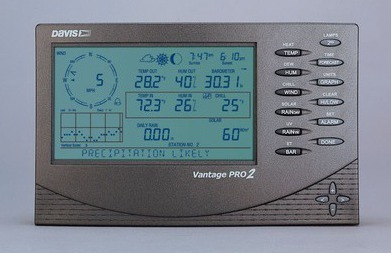 The weather-station is a Davis Vantage Pro 2 manufactured in the US. 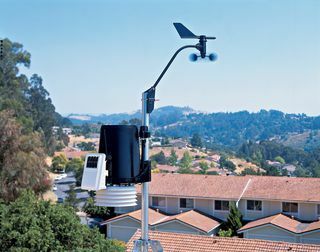 It is a cabled weather station with a versatile sensor suite that combines a rain collector, temperature, humidity, anemometer, UV and Solar sensors, all assembled into into one unit. The weather-station is connected to a display console, located inside the office, which can record all measured weather data. The information recorded can be used for useful research into the effects of UV, rain and wind on selected building materials. It is planned to install a web cam for viewing the local landscape and weather conditions soon.